Believe it or not this entire dish is gluten free and beyond delicious!!!! Dave and I grilled out and although my burger wouldn’t hold together well enough for a grill, he ended up eating 1 of his meat burgers and 2 of my veggie burgers! 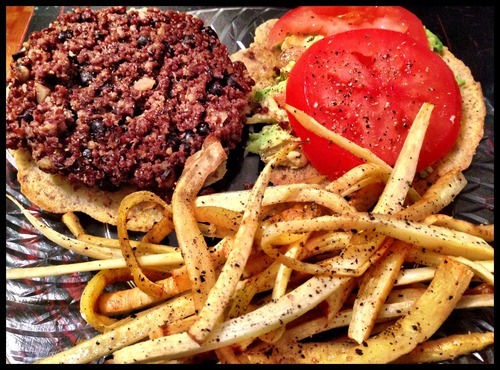 I got the burger and fries recipe from one of my new favorite blogs – Love and Lemons. (Basically I find ones that I like then regurgitate them to you guys if they are amazeballs.) I saw the link to the gluten free bun on a fellow healthy foodie’s Facebook page, and this is what happened… 🙂 The recipes are all below for each part of the dish. FYI – on the burger – I didn’t have flax so I used more flour and an egg white. I think you CAN grill them, but you need to bake them for at least 10 minutes before putting them on the grill, otherwise you’re going to have a mess. I think the flax may hold it together better, but either way it was a pretty awesome burger!! Add the worcestershire, balsamic, tomato paste, grated beet, walnuts and THE FIRST 1/2 CUP black beans. Stir and cook for another few minutes and turn heat off. Transfer mix to a bowl and stir in the remaining 1/2 cup of black beans (smash them a little as you stir), and 1/2 CUP of the quinoa. (You can taste & adjust seasonings at this point if you want to because there is no egg). Stir until this is all very cohesive then divide into 4 segments and roll into balls. Place the 4 balls on a plate and sprinkle them with the remaining 1/4 cup quinoa. Gently roll them so the quinoa coats the outside of the balls, then press each in the palm of your hand to form patties. Place on parchment paper (on a plate) and chill for 20 minutes. Scrub your parsnips clean and lightly peel them (you don’t have to peel them if yours are really clean). Slice into thin strips. Remove from oven and serve immediately, they’re best hot. Ingredients – FYI – if you want a thicker bun – double the recipe! Blend together, let settle to thicken. Spilt mixture into two and spoon onto oiled parchment and bake 10 mins at 350 degrees.